A heavy mist of steam rises above the San Juan River, tendrils of silver incandescent vapors dance against a columbine blue sky. The sound of water splashing, falling, running, tinkling fills my head, but the sound alone cannot soothe the chronic pain I feel pulsing from beneath my left shoulder blade up into my skull and down through my elbow, numbing the fingers of my left hand. A couple canoodles in a nearby tub. Children laugh as they roll around in warm water spilling into the river. All I think about is relieving the pain that has pierced me for more than two weeks. No amount of self-shiatsu with a tennis ball, serious doses of ibuprofen, stretching, yoga and other physical therapy exercises I learned throughout my recovery from a car accident seven years ago have helped. It’s the first time in two years I’ve been unable to manage the pain. I want to slip into the first tub outside the Mediterranean style bath house, but the “Sunset Social Club,” is filled with people waiting to watch the late summer sun sink beyond the horizon turning the clouds into flaming colors of magenta and coral. I’m not feeling social so I meander over to the “Overlook” and lower myself into the mineral-laden water. Ahh, yes, this feels good. It’s about 102 degrees and there are only two other people in the pool. I sink to my knees so the water is up to my neck. Fifteen minutes later I emerge, wrap my steaming body in a thick towel, grab my water bottle, climb down the stairs and wade across the pond to the waterfall tub. The water here is warmer, about 106 degrees and therapeutic water falls from the cliffs above into the tub and down the side of the tub into the pond. After fifteen minutes in this tub I’m ready for a massage. I cross the parking lot and enter the spa hoping that this will indeed relieve my pain. I’ve requested a deep tissue therapeutic massage and am pleased with the results. The therapists knows how to get under the shoulder blade, how to work out the knot that is pinching nerves. I go home and sleep after the treatment and wake up the next morning the pain dissipated. I soak again the next day with my family, and by the third day, I am pain free. 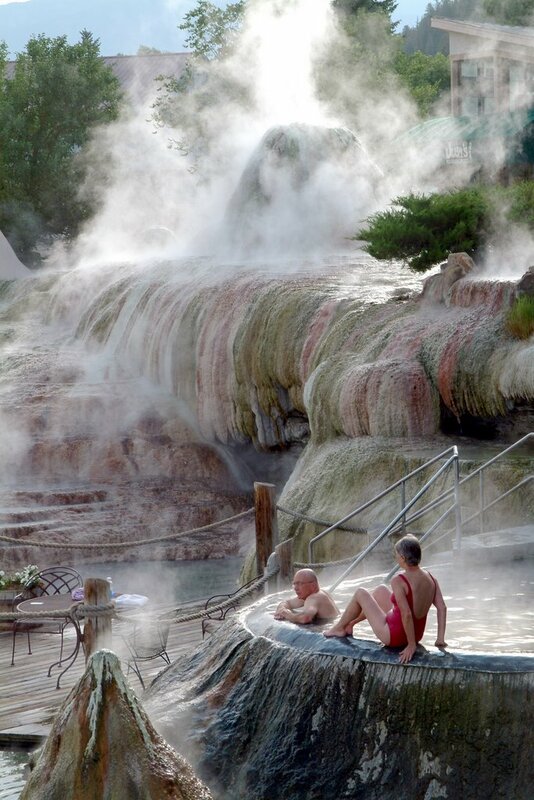 Pagosa Springs is home to the world’s largest and deepest natural mineral hot springs. In 1890, a U.S. Army Surgeon, Dr. J.L. Weaver published the first testament of the healing powers of the water after studying their effect on several chronically ill soldiers brought to the springs for treatment. He wrote, “the waters of Pagosa are without doubt the most wonderful and beneficial in medicinal effects that have every been discovered.” The soldiers were cured of rheumatism, arthritis, gastric problems and even syphilis. “Several who had almost immovable joints now find them supple and are able to work,” Weaver wrote. The idea of “salus per aquam” (health through water) is one with ancient traditions, inscribed on the walls of Roman bathing facilities. As early as the Fourth Century BC Hippocrates prescribed bathing in and drinking spring water for its therapeutic effects. And throughout America, Native indigenous tribes considered geothermal places as sacred homes to the Great Spirit who provided healing. Pagosah is a Ute word loosely translated to mean boiling water (though some elders conjecture that is really means healing water or smelly water). The smell comes from the high sulfate content, about 1400 milligrams per liter of water. It is relatively unnoticeable as one wanders from pool to pool. Pagosa’s Hot Springs Resort and Spa provides 18 different soaking pools that range in temperature from 83-114 degrees Fahrenheit. The 114-degree pool is called the Lobster Pot. I’ve only been in this pool and once and trust me, when you emerge your skin is the color of a boiled crustacean from Maine. The resort recommends soaking for ten minutes then wrapping in a towel or robe to sweat and cool the body. It’s easy to do, you soak in one pool, get out, wrap in a big fluffy robe and walk to the next pool, or sit and drink water from one the dozens of tables or lounge chairs. People relax languidly on the edges of pools, incandescent vapor rising from their bodies now warmer than the air around them. Then when cooled, slip back into the warm mineral filled water. It’s also a good idea to drink a lot of water before you arrive at the pools, to enhance the opening of pores through which the minerals are absorbed into your body and bloodstream. Some think it is the heat that provides the curative effects, but many claim that it is the mineral content of the water that is healing. In Pagosa, the water is made up of 790 milligrams per liter of sodium, which is equivalent to the salinity of seawater. Salt soaks are known to relieve symptoms of arthritis. Ninety milligrams per liter of potassium, which normalizes heart rhythms, assists in reducing high blood pressure, eliminates body toxins and promotes healthy skin. Twenty-five milligrams of magnesium, which maintains normal heart rhythms, converts blood sugar to energy and helps maintain muscle tissue and hormone levels. Fifty-four milligrams of silica, which strengthens bones, boost the immune system, promotes healthy nerves, mucous membranes, hair, nails and is used to treat acne and migraines. Boron, 1.8 milligrams per liter, boosts brain activity, builds muscle mass and strengthens bones. Trace amounts of iron, .08 milligrams per liter, help build up the blood and increases resistance to stress and disease. Lithium, 2.9 milligrams, produces positive effects in mental balance and gastrointestinal conditions. Manganese, .23 milligrams, helps nourish nerves and the brain and is a catalyst in the breakdown of fats and cholesterol. The 1400 milligrams of sulfate rid the body of toxins and promotes the health of bones, hair, nails, and the fluid in joints and discs. Sulfur is an anti-inflammatory agent. Trace amounts of Zinc, only .01 milligrams per liter, are still beneficial. Zinc is an antioxidant, promotes the healing of wounds, maintains male hormone activity and aids in digestion as well as helping to ease the symptoms of a common cold. Even trace amounts of arsenic, .12 milligrams, are being shown to benefit plasma and tissue growth. Calcium Fluoride, 4.3 milligrams is a constituent of the elastic fibers of the skin. Chloride, 180 milligrams, benefits the musculoskeletal system. While many of these claims cannot be substantiated, there are legions of followers who soak every day and share tales of miraculous healing. And while I’m not an annual pass holder who soaks daily or even weekly, the therapeutic water definitely helped relieve my chronic pain. And for those who want to live on the wild side and actually drink the water, here is what the locals recommend. Let the water settle for 48 hours and then decant the liquid and sip. But beware it has powerful purgative effects. The Springs Resort has something for every generation, from baby boomers to generation Z. This summer they added a fresh water swimming pool for swimming laps and a Jacuzzi tub for those who prefer to soak in “regular” water. They have also created two adults-only mineral pools. With family friendly activities like swim-in movie nights and live concerts and a full-service spa and salon, the Hot Springs of Pagosa Springs is a great place for parents, children and grandparents. Most importantly, it always has been and always will be a place for a healing. December 1, 2005 in ART.